If you know me, you know I love an early morning, get out of bed, fresh look, along with an after-hours dewey glow. I’m addicted to the point where I don’t go a day, no matter how busy I am with school, work, or my relationship, without sparing those sacred twenty minutes to my beauty routine. This, more often than not, consists of testing out a new face mask. As a fashion writer whose work often crosses into the beauty space, I have always known the benefits of sticking to a daily workout routine, removing my makeup before lights out, and drinking plenty of water throughout the day. Inspired to look and feel my best as a young New Yorker and a bit anxious to reverse the signs of aging that comes with too much fun in the sun and the city pollution, I am constantly looking out for new ingredients (hydrochloric acid, retinol, green tea extract), products (serums, toners, exfoliators), and foods (lemons, greens, probiotics) to transform the pores, acne scars, and laugh lines that have marked my face, making me long for the carefree days of my adolescence. My search for the best face mask started while I was still in high school. All of my Korean friends seemed to achieve the cloud-like, glow so effortlessly, but I was struggling incessantly just to get the dark circles under my eyes to disappear. There is no beating around the bush, so let me be frank: I have been cursed with “ugly skin syndrome.” It does not matter the season, the weather, or if I’m awake, sleeping, have makeup on, or am going au naturel. There is a good chance you will find me on any given day with a different foundation, moisturizer, concealer, or serum on. But, let’s be real. Good makeup means nothing without good skin, and that, I don’t care who says they are unnecessary “luxuries,” calls for face masks. When I started my search for the perfect face mask, I knew it would be a long search, in and out of beauty supply stores and face treatment consultations. I really wanted to find one that didn’t come with ingredients I was unfamiliar with, or that would leave my face feeling sticky or cakey (I have been, slowly but surely, been trying to cut back on the amount of artificially smelling and made beauty products I have been buying on a day-to-day basis). 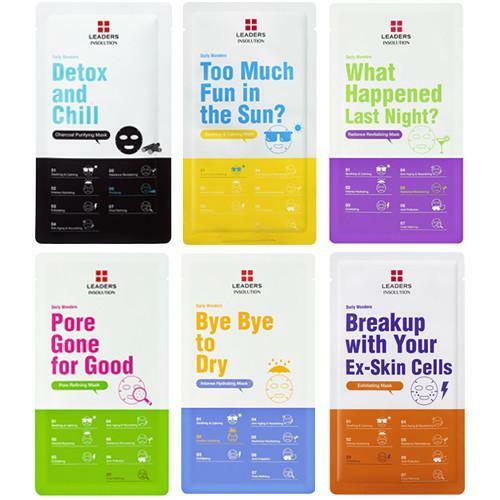 All these requirements and mere necessities have led me to one brand: Leaders Daily Wonders masks. The name alone reflects the miracles this product has performed on my troublesome skin (I am the unlucky oily gal with blemishes in the weirdest of places on my chubby-cheeked, oval-shaped face). Originating from Korea, claiming over 10 years of experience in the global skin care industry, the brand understands the universal worry we have for our skin, using safe and potent ingredients in products. 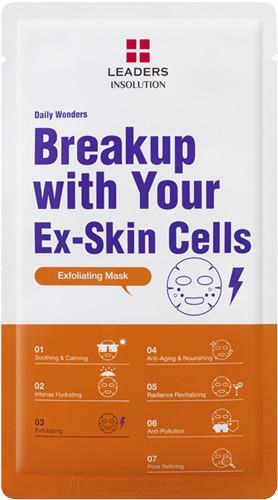 At first, I started off with Breakup with Your Ex-Skin Cells for exfoliation and clarifying with my primary goal being to get rid of the dull, tired-looking complexion that has led to both my parents sending me monthly care packages, mostly consisting of protein and vitamin c, and whatever else they think would make me look less like a walking zombie masquerading as a prim and proper tootsie. I knew that from my skin care journey, that exfoliation is vital to keep skin clear and renew hydration, so I knew this mask would be a safe, and potentially wondrous place to start. Magically, this mask, which also includes witch hazel and alpine willow herb extracts left my skin feeling even and clear. The quality of the cotton sheet mask was dewey and with so much serum left over, I used it over the next three days and, let me tell ya, as a gal with the typical New Yorker lifestyle, this one was a savior. 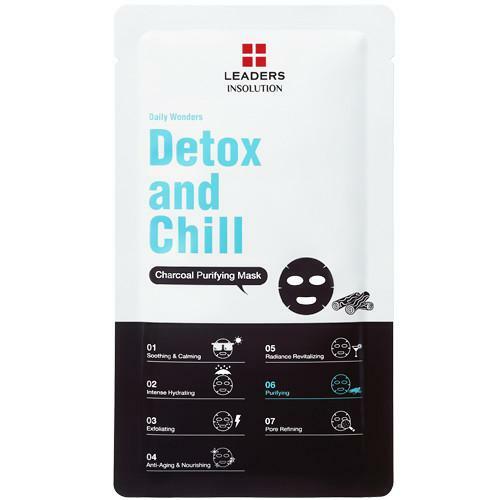 Then, the experimental chameleon that I am, I decided to try a different product from the brand just for kicks: Daily Wonders Detox and Chill. Truly, I was skeptical and a bit hesitant that this mask was actually working, as the effects of most, in my experiences, usually last for only a few hours, and then I am, sadly, back to where I started. I would often find myself staring in the mirror at my face throughout the work day – even seeking the opinions of friends and classmates – just to see if there was any change to my complexion. At $5 a mask, compared to other masks on the market, it is a steal. Plus, you’ll know that your money is gong to radiant, luscious skin, with the minimum of harmful and potent chemicals. Now, please excuse me while I go to treat myself to another Daily Wonder mask.